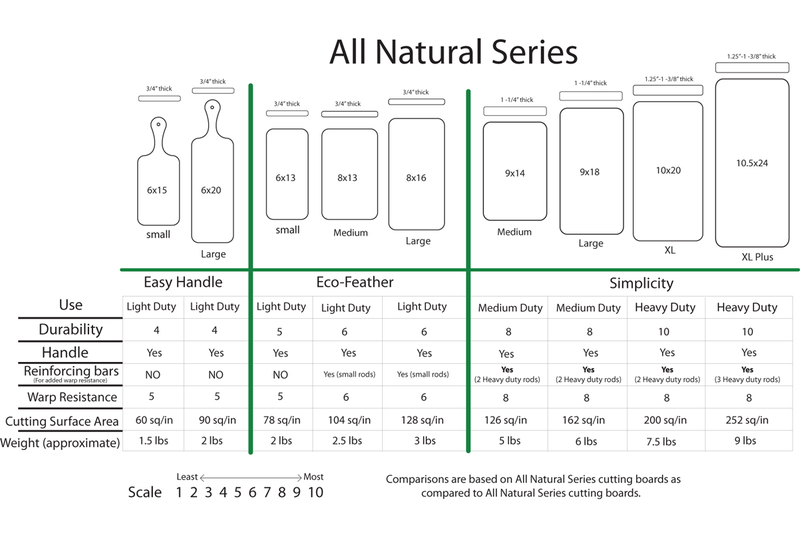 This is the Large size version of our All Natural Simplicity Series Line of cutting boards, perfect for all of your heavy duty cutting or chopping needs. It is approximately 9" Deep x 18" Wide x 1.25" thick. (Sizes can vary slightly +-1/4"-3/8" as each of these are custom made from one piece of wood) This is the perfect sized board for someone who cooks large meals but does not want a cutting board that is too big and takes up too much counter space or storage space. *All cutting boards (regardless of finish chosen) use organic beeswax to fill imperfections as well as to water seal the feet and re-enforcing bars. This cutting board is made of one solid piece of face grain Canadian hard Maple. It contains NO GLUES or toxic adhesives of any sort and is completely natural. Remember, that because it is made with one piece of hard wood there are always some completely natural discolorations and imperfections like mineral staining, spalting, knots, etc. There may be darker and lighter areas as well. As we do not fill holes with epoxies or other toxic substances, we DO NOT sell cutting boards with holes, grooves, or any significant defects in the top of your board that could harbor bacteria, there can be some in the bottom or sides as it is not a cutting surface. Knots and holes are filled with All Natural Canadian Organic beeswax. This board is exactly what we wanted. It's sturdy, well-made, and we were sent very thorough instructions on how to best care for it. We ordered the Flax Oil, as well, to keep it protected and it has worked great. Thank you so much for making a sustainable, non-toxic cutting board that will last for a long time! Finally, a safe cutting board option! Heard about Urthware products through a healthy/natural living blog and decided to try a few of their cutting boards. It is a relief to be using a cutting board for my family that doesn't contain toxic glues or other chemicals. Not to mention the boards are beautiful, practical, and easy to care for. Thanks Urthware! All I can say is "WOW!" I work in the art profession, and have great interest in wood creations. When I received this cutting board two days ago, I almost refused to touch a knife to its beautiful surface! I finally had to do a bit of chopping action tonight, and used my new (expensive) knife set on this board. Again, "WOW!" My former bamboo cutting board had little "give" with even the lightest of knife strokes. This Urthware board didn't push back on my knife, and helped me to get the precise finishing-edge to the tomatoes I cut. It's a true work of art, but a functional one at that. Thank you, Urthware! I'll never cut on anything else again! The second I opened the package I knew that whoever made these boards truly cared about not only what they do, but how they do it. After looking at the beautifully crafted board it dawned on me that I do not think I have seen a board that wasn't just a bunch of glued pieces until now. I loved the instructions for how to care for the board as well, so I know how someone who loves and wants to prolong the life of their boards would do it without having to look it up. An the amount of beeswax and walnut oil that was recommended was spot on so I never waste any or under oil my board. Can't say enough about the quality of these and how much I appreciate the small footprint approach. Obviously them being non-toxic was the main draw but they exceeded my expectations.